Summary: Learn how to run a spur from a ceiling rose, run a spur from a junction box, run a spur from a new junction box and run a fused spur from a socket outlet. * Notifiable project requiring Building Control approval if installation is located in a kitchen, bathroom or other special location, which defines rooms fitted with a bath or shower, an area in close proximity to a swimming pool or in a sauna. 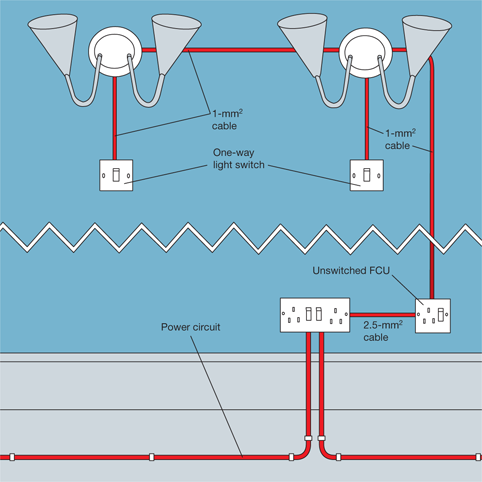 There are various ways of extending a lighting circuit to add lighting points: You could run a spur from the last ceiling rose in a loop-in circuit; run a spur from an existing junction box, or from a new junction box; or run a fused spur from a socket outlet. Prepare the cable route for the spur from the last ceiling rose on the loop-in circuit to the new lighting point. Prepare the cable route for the switch cable from the rose to the new switch. Unscrew the rose cover and slide it down the flex. Feed the new 1mm2 two-core-and-earth spur cable through the entry hole in the rose base along side the existing cables, loosening the base-plate if necessary. 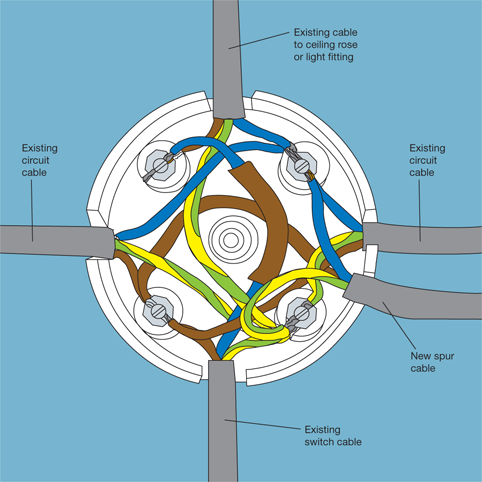 Connect the spur cable to the existing rose: live core (brown) to a spare terminal in the central block next to the other live cores (red/brown); neutral core (blue) to a spare terminal next to the existing neutral cores (black/blue); earth core to the earth terminal. Connect the other end of the spur cable to the new ceiling rose in the same way. To connect the light fitting to the rose, follow the instructions for installing ceiling lights or installing a wall light. Prepare the cable route for the spur from the junction box to the new lighting point, using 1mm2 two-core-and-earth spur cable. Unscrew the junction box cover. Make a diagram of where all the cores connect. Feed the spur cable into the junction box. Prepare both ends of the cable and the cores. Connect the live core (brown) to the same terminal as other live cores (red/brown) are connected; connect the neutral core (blue) to the same terminal as neutral cores (black/blue); connect the earth to the earth terminal. Replace the cover on the junction box. Continue following instructions for installing ceiling lights or installing a wall light. 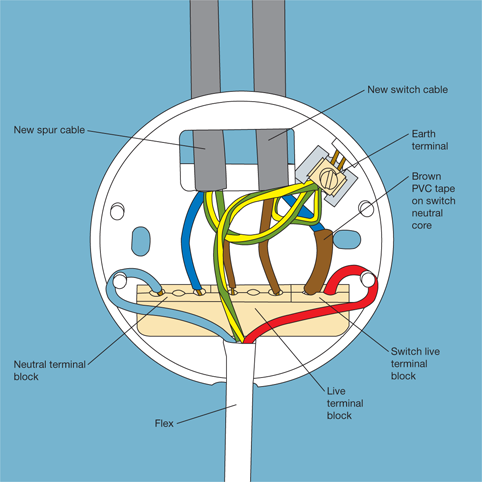 To connect a new junction box, you will need to locate the circuit cable connecting roses and junction boxes. 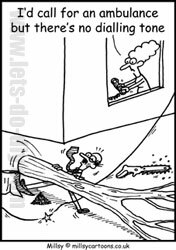 To trace the correct cable, lift the floorboards or gain access to the area directly above the ceiling. Prepare the cable route for the switch cable from the junction box to the new switch. Choose a joist to screw the junction box to. Screw the base of the junction box to the side of a joist with the circuit cable running across it. Cut the circuit cable where it runs over the junction box base. Prepare both ends of the cable and sleeve any bare earth cores. In a three-terminal junction box, where there is no switch running from the junction box, match up the live, neutral and earth cores of the circuit cable and spur cable and connect each type of core to one of the three terminals. At a four-terminal junction box connect the live (brown) core form the flex or lighting fixture and the brown-tagged blue core (tagged live) from the switch cable to one terminal; connect all the remaining live (brown/red) cores to one terminal; the neutral (blue/black) cores to another terminal; and the earths to the last spare terminal. If a lighting circuit would be overloaded by the addition of another spur, you can create a sub-circuit by running a spur from the ring main circuit or from a socket outlet to the lighting point via a fused connection unit (FCU). 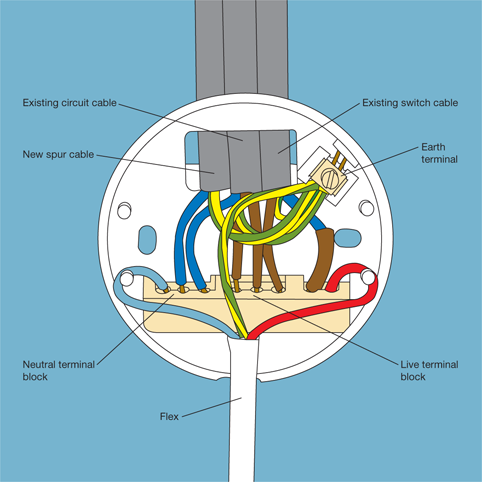 Connect a 2.5mm2 spur cable to either a socket outlet or a junction box by following the instructions for Extending circuits. Prepare the cable route from the junction box or socket to the FCU. Prepare the cable route from the FCU to the lighting points. If you wish the light fixtures to have separate one-way switches instead of being controlled by a switched FCU, prepare the cable route from the lighting point to the switch. Connect the other end of the spur cable to an FCU. If the cable has been placed in a conduit, pull enough cable through the conduit to connect it to the face-plate. Prepare the cable and cores. If the earth cores are bare, cover the exposed end with a green-and-yellow sheath. 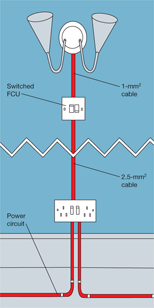 Connect the spur cable to the FCU face-plate: Connect the live wire (red or brown) to the terminal marked L IN, connect the neutral (black or blue) to N IN, connect the earth to the nearest earth terminal. If the FCU has a metal mounting box, ensure it is earthed: an earth core should run between the mounting box and face-plate. With plastic mounting boxes, the earth cable should be placed in a plastic strip connector. Fit a 5 amp fuse in the face-plate. Run 1mm2 cable from the FCU to the new lighting point. Connect one end of the cable to the FCU: Connect the live wire (brown) to L OUT, connect the neutral (blue) to N OUT, and connect the earth to the nearest earth terminal. Connect the other end of the cable to a ceiling rose or lighting fixture. Continue following instructions for installing ceiling lights or installing a wall light. 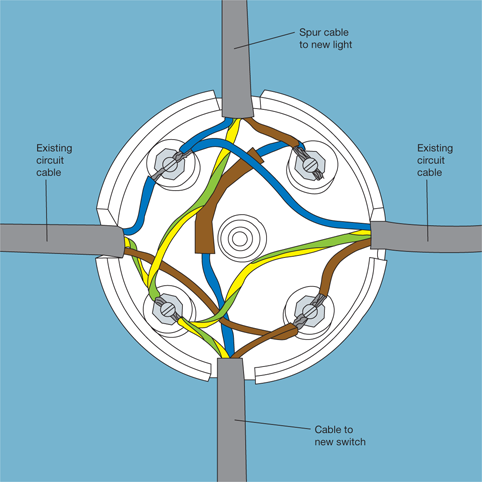 To connect multiple light fittings, run a length of 1mm2 cable from one ceiling rose to the next following the method above for running a spur from a ceiling rose.